NOTE: Since this is #150 in the Minimate Mini-Reviews, we decided to make it something special: instead of just reviewing one set from Series 45, we're going to look at the entire thing. The review is is on three pages, a page for each set. There's a little "next" button on the bottom of the page to take you to the next page (and you can navigate between them by just clicking on the little 1, 2 and 3 at the bottom, as well). What is Loki's plan for humanity, and what does it have to do with a race of beings from another world? If the trickster god hopes to rule Earth, he'll need the advanced power of another planet to subjugate mankind to his will. 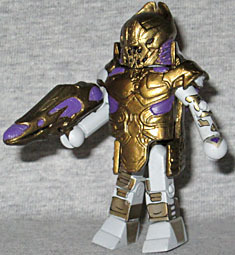 For whatever reason, everybody seemed to have trouble making a good Chitauri action figure. The Marvel Select version didn't have any weapons, while the Hasbro versions didn't have any elbows or knees. The Minimate doesn't have any of those problems, though: he has all his joints, and is armed with a rifle (perfect for Black Widow to steal from him). Though he has the "tall" feet, he could have used new hands to make them more alien. 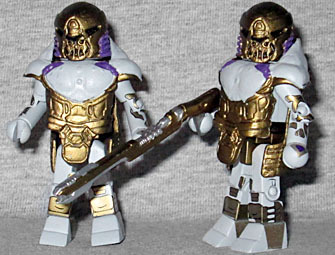 He has an ornate new chest cap, while the armor on his arms and legs is simply painted on. An agent of S.H.I.E.L.D. (Strategic Homeland Intervention, Enforcement and Logistics Division), Maria Hill reports directly to director Nick Fury, and is among the key support staff to the Avengers Initiative. Kids, in the summer of 2012, your Aunt Robin joined the Avengers. 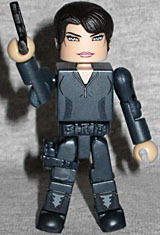 Cobie Smulders makes a great Maria Hill, and this Minimate really looks like her. She's wearing a SHIELD uniform, with logos on the shoulders, and apps to suggest there's a human body underneath, not just a plain block. She has a utility belt and a holster on her right leg, plus of course a gun to fit in it. A lone Chitauri may be no match for a mighty Avenger, but a legion of these extra-terrestrial invaders presents a bold challenge to the newly assembled team. Will Earth's mightiest heroes be able to hold the line against the Chitauri fleet? Robert Downey Jr. improvised the "Galaga" line in Avengers, but it completely foreshadows the end of the film. Galaga is all about fighting off wave after wave of alien invaders who appear from the top of the screen, then go flying around; the Chitauri pretty much do the same thing through their portal, don't they? The Chitauri General wears a more ornate chest cap than the Footsoldier did, with heavier armor that covers more of the body, and has a small cape hanging off the back. He also has a fancier helmet, and more armor painted on his thigh. Instead of the rifle, he has the shorter, chunkier style of gun. Sure, his arm should go into the gun, not hold a handle beneath it. Oh well. Also, it would have been nice if they'd painted faces under the helmets. This entry was posted in Art Asylum, Marvel, MMMR and tagged Avengers, Captain America, Hulk, Iron Man, Minimates, Thor. Bookmark the permalink. Shame the Halo elites have smaller heads; they'd make decent Chitauri heads. Also, so the troop builder is the... variant? And Maria comes with both versions? That seems a bit... silly. Would've been nice if there were a battle-damaged Maria version. Considering she spends about 3 minutes of the film with a non-cut-up face, it'd be a lot more accurate if she had some cuts on her face. Oh, okay. Sorry, the label Maria Hill and Chitauri made me think that it was always a Maria and a Chitauri. No Fury/Loki or Hawkeye/Widow review? Or were those done in another post I'm forgetting about?